Iowa Auto Accident Wrongful Death Lawsuit Recoveries | Hupy and Abraham, S.C.
Is a Wrongful Death Case Right for You After Your Loved One Has Died in an Iowa Car Crash? Thousands of people have lost a loved one in an Iowa traffic accident. In 2015, approximately 317 people lost their lives on Iowa roads, and many more people than that were left mourning their deaths. Many survivors are left with an important question. 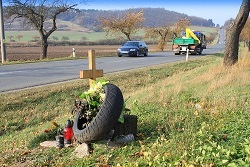 They want to know whether it is worth it to pursue a wrongful death case after their loved one has suffered the most significant type of car accident injury—death—in a motor vehicle accident. Whether you have the authority to make the decision. In Iowa, it is the personal representative of the decedent’s estate who has the legal standing to bring a wrongful death case. If your loved one died with a will in place, then the personal representative may be the executor of the will. If your loved one died without a will, then the court will appoint a personal representative. Whether you still have time to file a case. Generally, you have two years to file a wrongful death lawsuit in Iowa unless an exception to the statute of limitations applies. What makes a successful wrongful death case in Iowa. In order to recover damages in a wrongful death claim, someone other than your loved one must have been primarily responsible for causing the crash. Thus, you will need to prove that someone else’s negligent or intentional actions caused the accident and your loved one’s death. Additionally, you will need to comply with the court’s requirements in filing a complaint to begin your lawsuit and with all subsequent filings, hearings, and other matters. What damages you may recover. Before you can decide whether it is worth it to file a wrongful death claim, you need to know what you may be able to recover if your case is successful. Generally, the estate may be able to recover compensation for medical bills incurred prior to death, funeral costs, lost income, pain, suffering and other damages. You also need to know how filing a case will impact your daily life so that you can anticipate any stress or inconvenience as you weigh your options. Every motor vehicle death is unique. To find out how Iowa wrongful death laws may apply to your case, we encourage you to call us today at 1-800-800-5678 to schedule a free consultation with an experienced attorney who can answer all of your questions and help you decide whether a wrongful death case is important for you and your family. Who Can File an Iowa Wrongful Death Claim?